Thomas Pepper was born in 1883 in Long Whatton. He was married twice and had six children in total. Him and his first wife Mary lived and worked in Mountsorrel, but he moved to Quorn with his second wife Fanny, in the late 1880s. The 1911 census finds the couple and their two sons living at Home Farm on Leicester Road in Quorn. This was the home farm for Quorn House (Meeting Street). The Peppers later moved to Home Farm on Soar Road, which was the home farm for Quorn Hall, at the other side of the village. 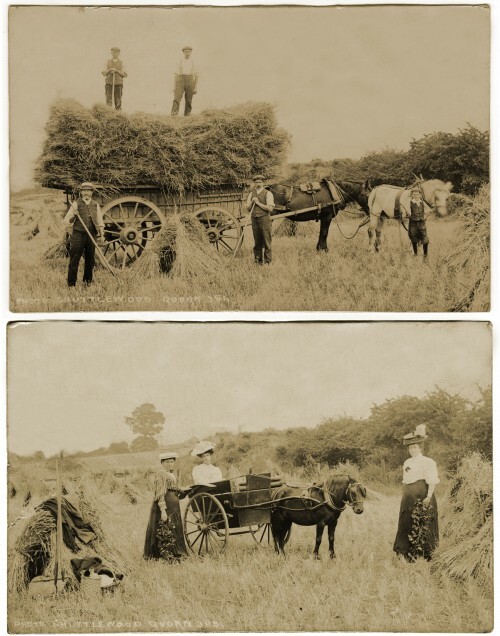 These two photographs were taken during the harvest, sometime between 1905 and 1909. The name 'Thomas Pepper, Farmer, Quorn' can clearly be seen on the hay wagon.